Seems like everywhere we go, buffalo wing stops keep popping up left and right. 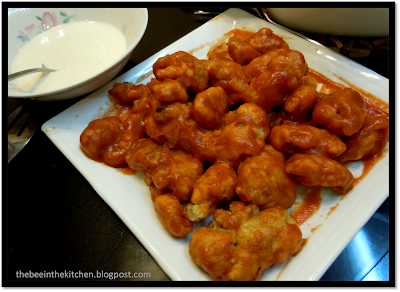 So, my kitchen- trying hard to keep up with "the in thing(s)" decided to have DIY buffalo chicken- tenders. Nope, didn't do wings since we just didn't feel like getting our hands dirty that particular day. But for sure, one of these days, I hope to try this on wings, sans the fillet preparation. 1. Mix the flour and cornstarch and set aside. 2. Marinate chicken fillet with soy sauce, chicken powder, salt, pepper, tomato sauce and hot sauce for at least 2 hours. 4. Dredge chicken in flour/ cornstarch mixture and fry in very hot oil until cooked. Set aside. 5. Mix tomato sauce and hot sauce together and bring to a boil. Pour over hot chicken. Just a side story about the wing stops popping up. We absolutely *heart* this little online deal we bought recently on the buffalo wings. 4. 4 degrees of spiciness to choose from.